SENSE8 will return for a second season, Netflix announced on Twitter. The news came on the Sensates’ shared birthday, and the cast sang to celebrate the occasion — and Brian J. Smith announced the season 2 renewal. 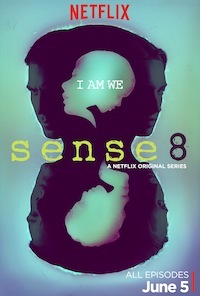 Are you excited for more SENSE8? On August 28th, Netflix is launching its latest original series, NARCOS, about the true story of the battle against the Medellin cartel in the ’80s. GRACE AND FRANKIE will return for a second season, Netflix announced via Twitter. The comedy stars Jane Fonda and Lily Tomlin, as two women whose long-term marriages end — after their respective husbands reveal they’ve been having a two-decade affair. Are you excited to get more GRACE AND FRANKIE? Netflix is releasing GRACE AND FRANKIE, a comedy about two women (Jane Fonda and Lily Tomlin) who find out that their husbands (Martin Sheen and Sam Waterston) are in love with each other, next month. Netflix is getting into the musical drama business: the streaming site has picked up the Baz Luhrmann-Shawn Ryan series, THE GET DOWN. Do you think you’ll be watching THE GET DOWN? THE FALL is returning to Netflix for a second season on January 16th, and Jamie Dornan (Paul), Gillian Anderson (Stella), and executive producer Allan Cubitt are coming to TCA to talk about what’s in store.